Articles about "Kingston USB Flash Drive New-Mini Fun G2" in this website is free. Read our reviews for "Kingston USB Flash Drive New-Mini Fun G2", gadget price, specs, features and find more latest Electronic Gadget Reviews and News. 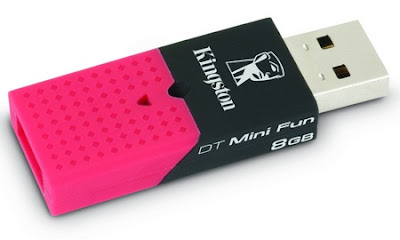 Kingston introduces its latest funny USB Flash Drives - , one of the largest and popular manufacturers of memory products, launched Kingston DataTraveler Mini Fun G2. User must have to get all the three color pieces to mix and match colours and snap together to create original shapes. As I told DataTraveler Mini Fun G2 looks funny with its three color combination design. Kingston offers the new DataTraveler Mini Fun G2 USB Flash Drive in 2GB, 4GB and 8GB storage capacities. Kingston DataTraveler Mini Fun G2 USB Flash Drive comes with USB 2.0 interface and has a rugged silicon rubber housing. 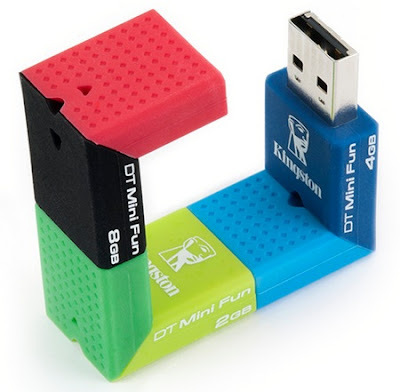 This 2GB, 4GB and 8GB Mini Fun G2 Flash Drives from kingston will be available in light/dark green, light/dark blue and black & red color combinations respectively. Fun — Mix and match colours and snap together to create original shapes. Tags: Kingston, Kingston DataTraveler Mini Fun G2 Review, Kingston DataTraveler Mini Fun G2 USB Flash Drive cost, Kingston DataTraveler Mini Fun G2 prices, Kingston DataTraveler Mini Fun G2 release, DataTraveler Mini Fun G2, Kingston DataTraveler Mini Fun, USB Flash Drive, Funny USB Drives, USB 2.0 Funny Flash Drive, G2 Fun, Kingston Data traveler, Kingston DataTraveler Mini Fun G2 Features, Kingston DataTraveler Mini Fun G2 Specifications, Mini Fun G2, usb-drive, USB-Flash-drive.